When I first started the Mawata Colossus, I’d envisioned all sorts of different squares, various riffs on the theme of an 8″x8″ sort-of-quilt-block, that would come together to make a quilt like jazz (hence the name, a play on Saxophone Colossus. Hubris, thy name is Cusser.) 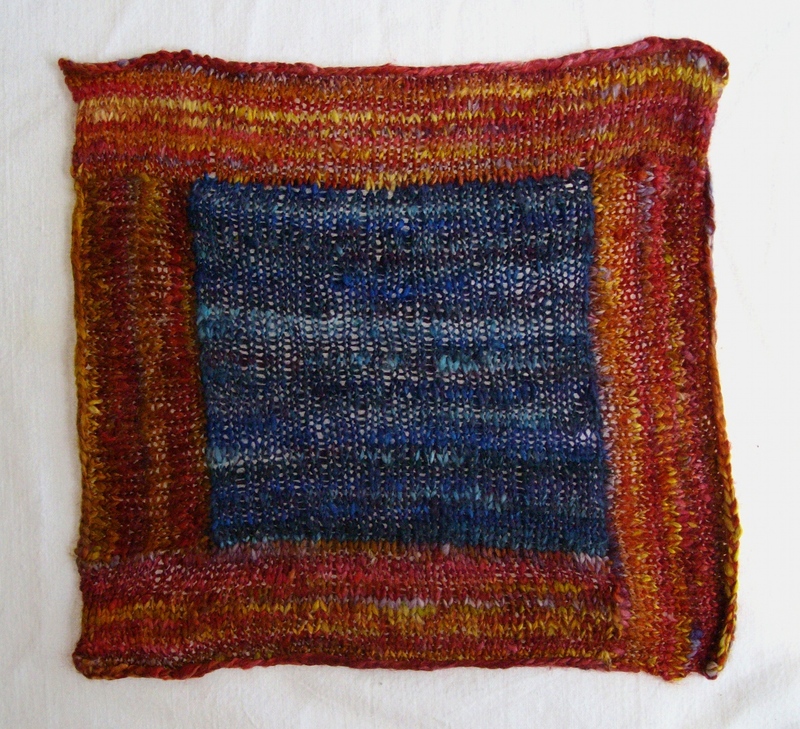 I did experiment with different ideas — various colour blocks formed using short rows; a series of triangles working out from a small centre square to form a larger square — but I kept coming back to the simple central square with a log cabin-type border. I think this arrangement works best because the fabric itself has so much going on in its texture and colours that adding a lot of different shapes into the mix made the whole thing look too busy to me. With a couple of variations in the size of the borders and central squares, these blocks work together to show off the fabric, without a lot of visual noise getting in the way. 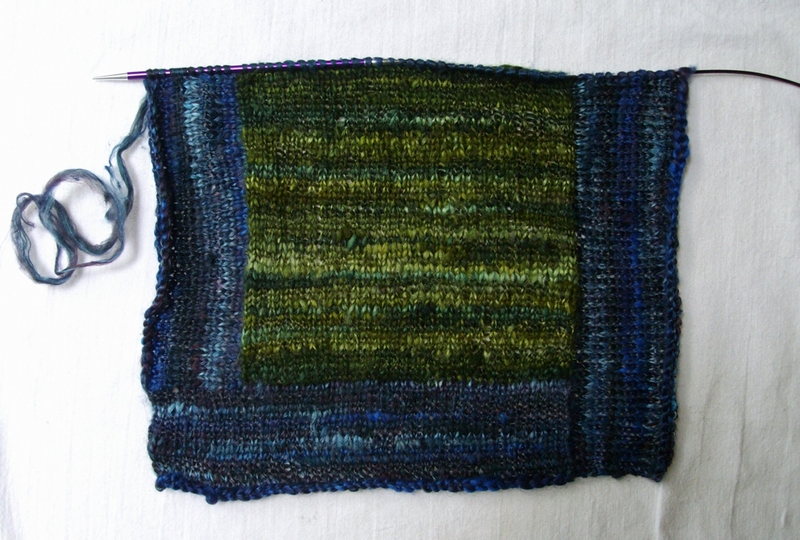 Here’s how I made the first block, a large centre square with a narrowish border, kind of like a picture window. Centre Square: With some mawata in your main colour (MC) pulled out and ready to go, cast on an even number of stitches to get your desired width (in this case, 32), plus 2 stitches for the selvedges. We’ll call that total number CS, for centre stitches. Work 48 rows (centre rows [CR] = [CS-2]x1.5) in stockinette stitch, knitting the first and last stitches of each row on both sides to make the selvedge. Bind off. First Border Section: With your contrasting colour (CC) and the right side facing you, pick up 34 sts (or CS) down the left side of the square: 2 sts for every 3 rows, plus one each at the top and bottom corners. This is where the selvedge comes in: pick up your stitches inside that weird-looking end column, so that you have a neat column of stitches below your working needle. Work 15 rows (so 16 rows including the pick-up row: border rows [BR]=CR/3) in stockinette, again knitting the first and last stitch of each row, ending in a purl row. With the right side facing you, bind off all but the last stitch — this will become the first stitch of the next border section. Second Border Section: Turn your work clockwise, and pick up 10 sts along the side of the first border section ([BR-1]x2/3) and 33 sts along the bottom of the square (CS-1 selvedge stitch used in the first border section). 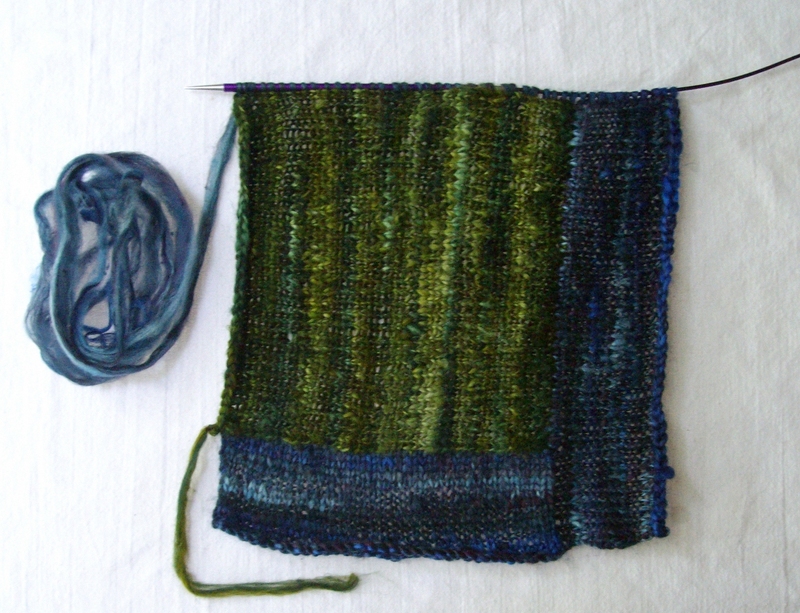 Including the stitch left active from the last bind-off, you will have 44 sts. Work 15 rows (or whatever your BR number is) in stockinette stitch, again with the knit selvedge stitches at the edges. Bind off all but the last stitch. Third Border Section: Turn your work clockwise, and pick up 43 sts along the next side: 10 along the side of the second border section, 2 sts per 3 rows along the side of the square (for 32 sts), and one at the last corner of the centre square: 44 sts including the last stitch of the last bind off. Work as for the second border section, above. Fourth Border Section: Turn your work clockwise, and pick up 10 sts along the side of the border, 32 sts along the top of the square (CR-2, as you have now used both of the selvedge stitches), and 11 sts along the side of the first border section (2 sts per 3 rows plus one at the last corner): 54 sts total. Work 15 rows in stockinette stitch with the edge selvedge stitches. 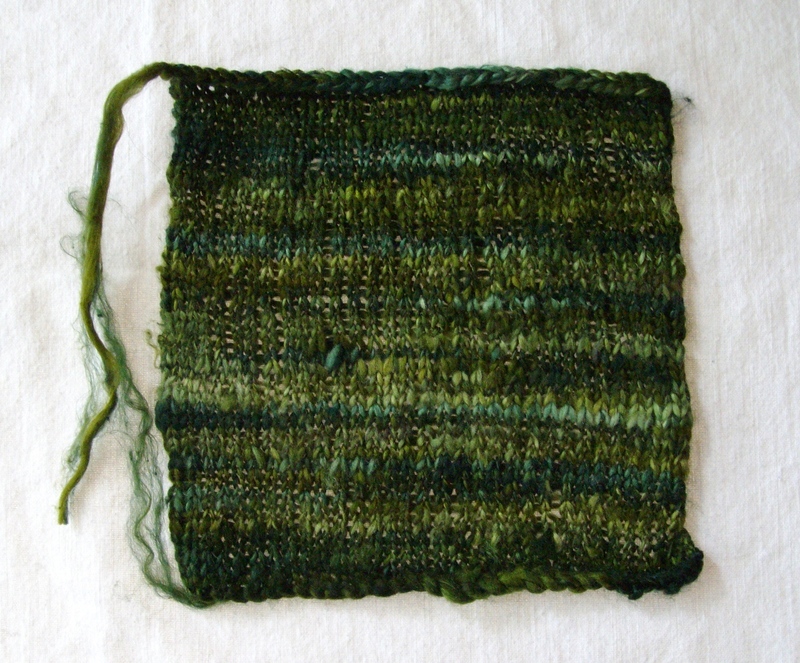 Bind off, weave in any ends, and block as described in the mawata knitting tutorial. 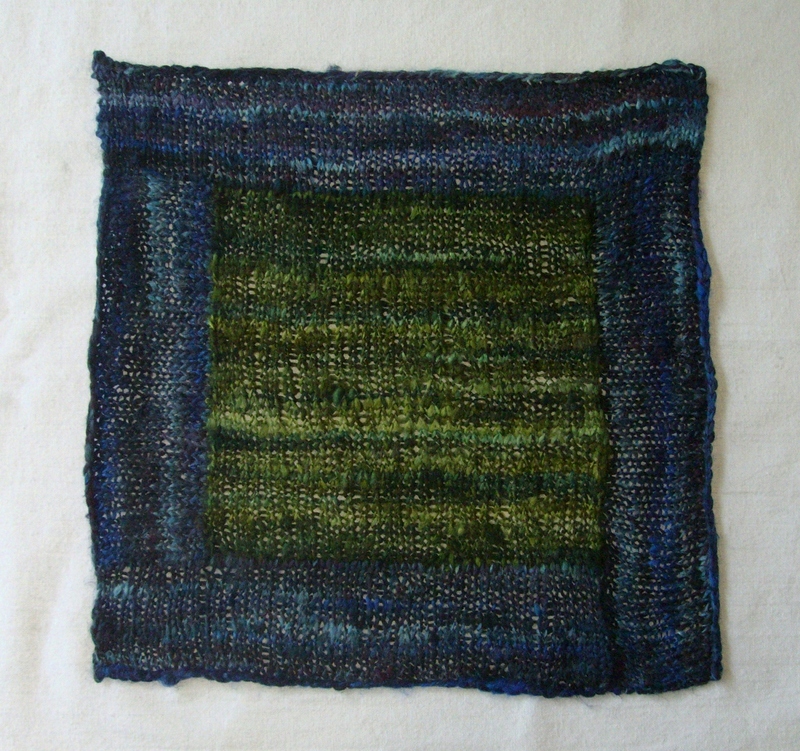 Now that you’re done, you have the total stitch and row counts for a square in the size you want to work with: from the fourth border section you have the total stitch width (in this case, 54), and adding the border rows (including the pick up rows) to the centre square rows gives you the total rows (in this case [16×2]+48, so 80, which is near as dammit to the stitch width x 1.5.) You can vary the sizes of the centre square and the borders, and even their placement (for instance, putting the ‘centre’ square in the bottom corner or slightly off to one side); as long as you keep the total stitches and rows constant, your squares should all come out the same size. Mawata Quilt Blocks: How do I knit with these things? You use such nice-looking yarns. Thank you! It’s true, I am a sucker for a pretty yarn, but you know what that’s like, don’t you?